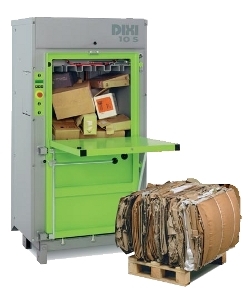 DIXI is a leading international company supplying balers and waste presses, supplying solutions to compact many different types of material, including cardboard, plastic, paper, polystyrene, tins, cans and drums and general mixed/food waste. Represented worldwide through a network of suppliers, DIXI are able to deliver and service our sale and hire baler solutions on a truly international scale. Being global to us means being close to our customers. Our solutions are centered on our range of hydraulically operated vertical and horizontal baling presses. Our customers can then enjoy the benefits of improved recycling, reduced waste costs and a sustainable efficient way of handling their waste stream. 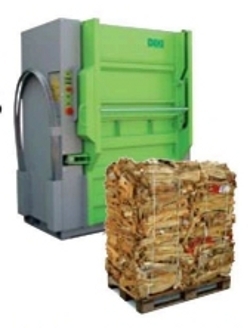 DIXI High Density Vertical Balers feature many innovations for ease of use and maintenance friendly access. 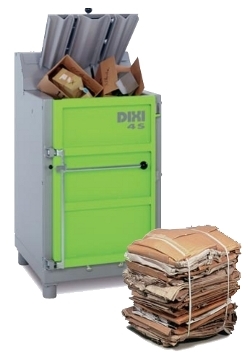 Features such as the side-mounted power unit with submerged motor and pump, front facing panel box, redundant feed gate interlock system, all add up to a reliable baler for years of trouble-free recycling. The Smart Relay adds safety features, easy setup, and diagnostic capabilities to your baler. The motor and pump are submerged in the hydraulic fluid tank which offers much quieter operation. Distinguished by such features as overall height being the greatest dimension, vertical balers provide ideal solutions to limited floor space environments. The very nature of the design lends itself well to a variety of materials. In most cases the DIXI vertical baler is hand fed. For materials that easily "flow", the vertical can be modified for conveyor feeding. A range of sizes and power pack configurations are available to suit your exact needs. 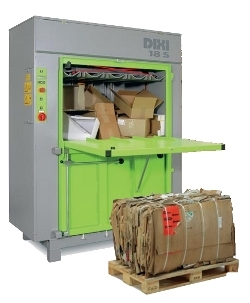 DIXI Horizontal closed end baler design is most commonly used where a more automatic means of feeding is required. While manual and semi-automatic systems are in frequent use, the automatic system operation with electric eye sensing features are most common. In addition to the benefits of reducing labor intensity, this design often operates with higher pressures for better bale density and is available with a choice of displacement capacities, hopper and bale sizes. Various designs are available to suit the preferred feeding method such as hand, conveyor, cart dumping and air system feeding. 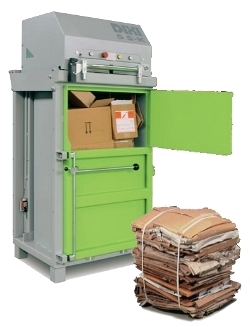 The horizontal baler is available in 3 standard versions closed end, open end and open end with automatic bale tier. Choosing a DIXI vertical or horizontal baling press is not only an environmentally sound decision, but the financial benefits can be great too. With a compaction force of 4 t - the proven, economical, hydraulic compact baler. The proven and economical hydraulic compact baler. All of the equipment including the cylinder and baling straps, is integrated in the compact housing. Advantages: feeding from the top makes this a space-saving solution. 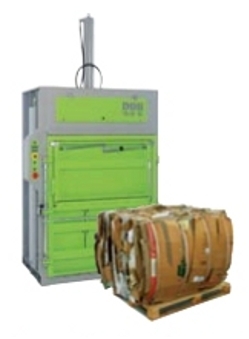 Being visually attractive makes this baler suitable for areas frequented by the public. The small floor space required of approx. 0.7m sq allows the DIXI 4 S to be placed in relatively narrow recesses. Easy operation - high safety standard. Rapid compacting cycle, automatic ram return, low noise level. Hold-down claws prevent stubborn materials from springing back. Visual indicator to show when full bale size is reached. Simple, low effort bale binding - low bale weight. Slight V-shaped press chamber aids in bale removal. with a compaction force of 5 t - the proven, expandable, hydraulic compact baler. The basic model of the hydraulic baler DIXI 5 S-K is delivered as a one-chamber baler - it can be expanded to any number of sections. The press ram slides easily across to the chosen chamber. Waste materials such as paper, cardboard, corrugated cartons, foils and plastics can be compacted according to categories after sorting for efficient and economical recycling. Visual indicator to show when full bale-size is reached. Sturdy, compact, low maintenance design. A power-parcel in the smallest place: High compaction force with a low space requirement. These baling presses are especially recommended for the retail trade and small to medium sized factories of any market sector. Micro processor control without limit switch. Low maintenance design. Well arranged LCD display. Automatic start when closing the feed flap - rapid compaction cycle, automatic ram return. Adjustable compaction time: The material can be kept under pressure. Easy tying of the bales and complete bale ejection. Two-phase hydraulic unit of the control block guarantees a rapid compaction cycle. Generous hydraulics: High compaction force with low hydraulic pressure and low drive performance. The successor of the well established DIXI 16 S which operates on many thousands of locations, is now available with a compaction force of 18 t and has an electronically controlled operating comfort: Switching of programming for the compaction of 'paper/cardboard' or 'foil' and variable bale size. Easy tying of the bales and hydraulic, complete ejection. Two-phase hydrualic unit of the control block guarantees a rapid compaction cycle. Generously designed hydraulics: High compaction force with low hydraulic pressure and low drive performance. The hydraulic vertical high performance balers. With the hydraulic vertical high performance baler with 25 or 30 tons compaction force, economically recyclable bales of up to 360kg are compacted. Advantage: No re-compacting of the bale is necessary in the recycling chain. This makes these bales particularly attractive and marketable. Micro processor control without limit switch. Low maintenance design. LCD display. Displayed are the operating functions and possible operation errors. The bale size and the switching from paper to foil can be programmed. Automatic start: feed the baler through the clap and close it - rapid compacting cycles, automatic ram return. Adjustable compaction time: material can be kept under pressure. Easy tie off of the bales and hydraluic, complete bale ejection. Rapid compacting cycles ensured by two-phase hydraulic unit. Generous hydraulics ensure high compaction force with low hydraulic pressure and low drive performance. With 60 / 80 t compaction force - for bales of up to 700kg suitable for recycling. Low overall height of only 217 cm - no assembly when installing the machine on site. The automatic opening of the feed flap assures easiest filling of the press chamber. Micro processor control without limit switch. Low maintenance design. Well arranged LCD display. The operating functions and possible operation errors are displayed. Switching of the programming from 'paper' materials to 'foil' materials. Adjustable compaction time. The Material can be kept under pressure. Easy tying of the bales with tying wire. Area of application: Printing companies or similar companies with automatic feeding of marginal or waste paper-stripes via extraction. 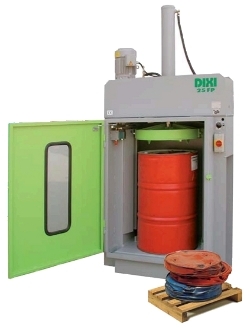 The DIXI 20 AP is equipped with a cutter for overlapping material. That makes the DIXI 20 AP appropriate for automatic filling. The finished bale is completely pushed out of the machine by the press ram. The triple tying at DIXI 20 AP takes place manually. Either with polyester tape or pre-cut wire. 25 tons of force collapse even the heaviest of all steel drums, underlining the effectiveness of the DIXI 25 FP drum baler. The surrounding spray guard with a large viewing window represents an optimum safety concept. The hydraulic and electric controls are integrated in the machine for maximum convenience and protection against damage. The inclusion of the fluid collection trough reflects the consideration given to the environment. Energy saving, quiet 2-stage hydraulics with automatic stop at end of cycle. Automatic stop compaction cycle: place drum in baler, push START button, remove the compacted drum. Fluid collection trough - can be connected to a disposal system. Venting spikes pierce holes in drum top for ventilation. Surrounding spray guard with viewing window for complete protection of operator. Electrical and hydraulical overload protection. Sturdy, enclosed, welded steel construction - maintenance free.